Vittoria d’Aste-Surcouf is a trained designer and bench jeweler who takes a classic approach to contemporary jewelry design. Vittoria’s specialty is custom-design and she works one-on-one with the customer to create unique, one-of-a-kind fine jewelry. With a keen artistic sense, she has designed engagement rings with matching bands, contemporary settings for loose gemstones as well as reinvented antique pieces of inherited jewelry. Having knowledge of jewelry fabrication she is able to communicate with both her clients and and bench jewelers as she speaks both languages. Vittoria's formal education is in fine art receiving an M.A. in Modern Art History from Christie’s Education (an affiliate of Christie’s Auction House) in New York City. Her jewelry education began as soon as she was able to sit on her grandmother's lap playing with her unique and stylish baubles. It is no wonder how natural the progression was to her becoming a bench jeweler, starting as an apprentice to a master goldsmith, C.Nikolas, in the Bay Area. Following her apprenticeship and ready to unleash her sense of design, she founded her own company specializing in custom jewelry designs. It is a pleasure to have Vittoria as part of Gleim Jewelers. 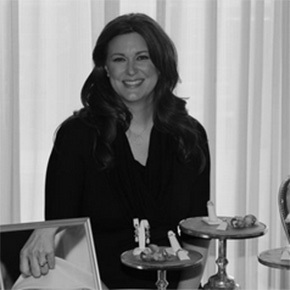 Amongst other accomplishments, Vittoria is a mother of two young boys and still finds time to serve as a Board Member with the Women’s Jewelry Association’s Northern California Chapter, ensuring that the world will not be short of fantastic designers. Vittoria is available at our Stanford Shopping Center location every Thursday.